Nearly a hundred tombs contain dishes, seals and an abundance of ancient remains. The archaeological group found a complex of tombs and a pit for sacrifices in the Dzungar region between the late period of the warring states and the early Western Han dynasty. The remains of sacrificed animals, including the skeletons of goats, cattle and dogs, were found in almost one-third of the 99 tombs. According to local authorities, a cluster of 99 ancient tombs, more than 2000 years old, was found in the autonomous region of Inner Mongolia in northern China. An archaeological group from the regional institute of cultural relics and archeology discovered a necropolis in Dzhungar Banner, including 99 tombs and a sacrificial pit dated to the late period of the Warring States (475-221 BC) and the early Western Han dynasty (202) BC -8 AD). Most tomb holders were found without coffins in tombs that vary in size. The largest of them was about five meters long, three meters wide and three meters high, and the smallest was slightly larger than the human body. According to archaeologists, animal sacrifice was a common burial ritual among residents living along the Great Wall in the period of warring states. The Great Wall of China at that time passed through part of northern China. Kitchenware belonging to the late period of the warring states, such as ceramic kettles, as well as 10 bronze national seals of the Western Han dynasty were discovered. 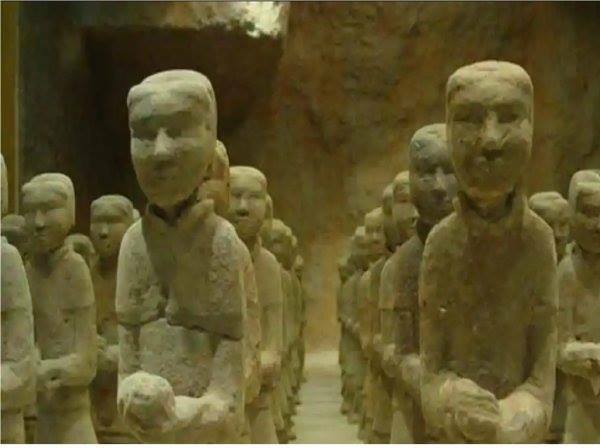 “This shows the area of ​​the tombs that were under the control of the central government during the early Western Han dynasty,” said Hu Chunbai, head of the archaeological group.